What is the difference between these types of straws? 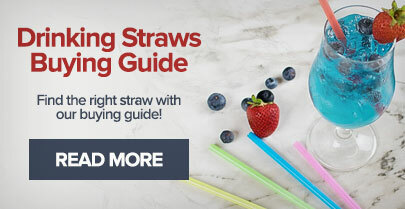 Straws are available in a variety of diameters based on their intended purpose and function. Sip straws are approximately 1/8" in diameter and used for cocktails and sipping on hot drinks. 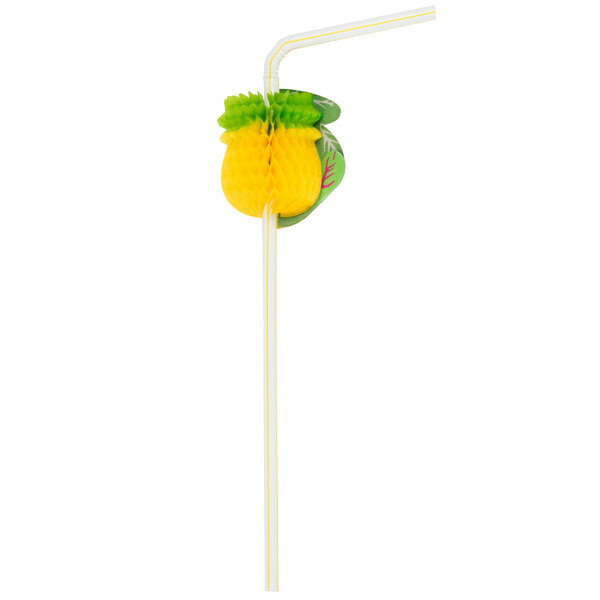 Jumbo straws are often the standard size for various beverages and measure around 1/4”. 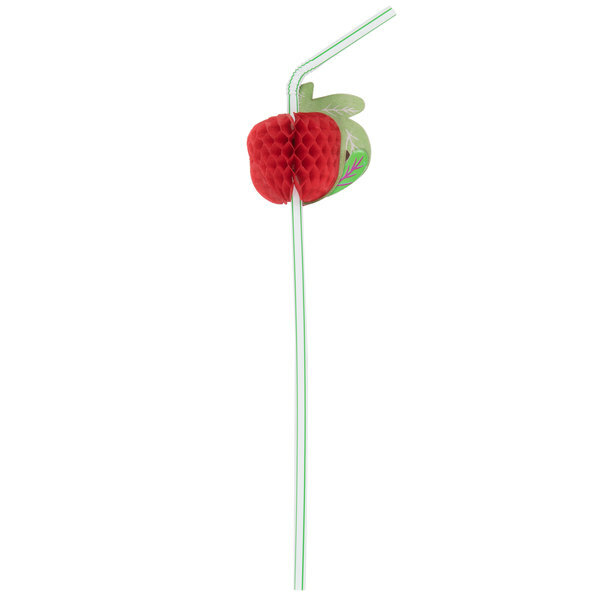 Super jumbo straws are also around 1/4” in diameter and some even feature built-in spoons for thick drinks. Milkshakes and smoothies are great for drinking out of Giant straws thanks to their 5/16" diameters, and Colossal straws at approximately 1/2" in diameter are perfect for frozen concoctions. 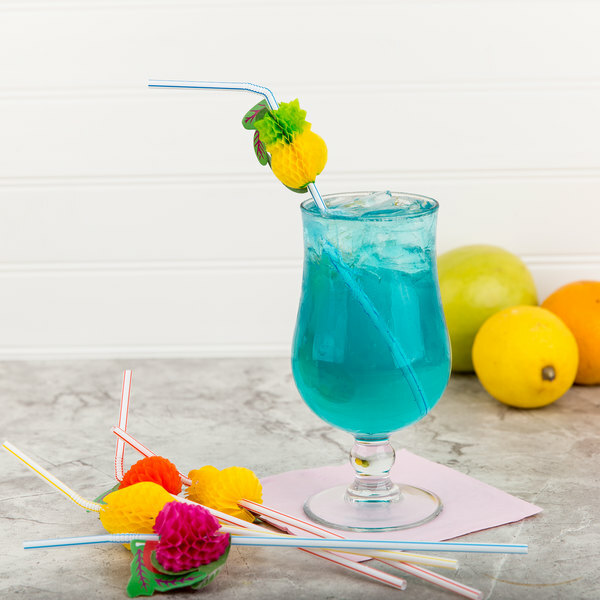 Turn your next party or special event into a luau with these colorful Royal Paper RS950F festive fruit straws that are fun for all ages! 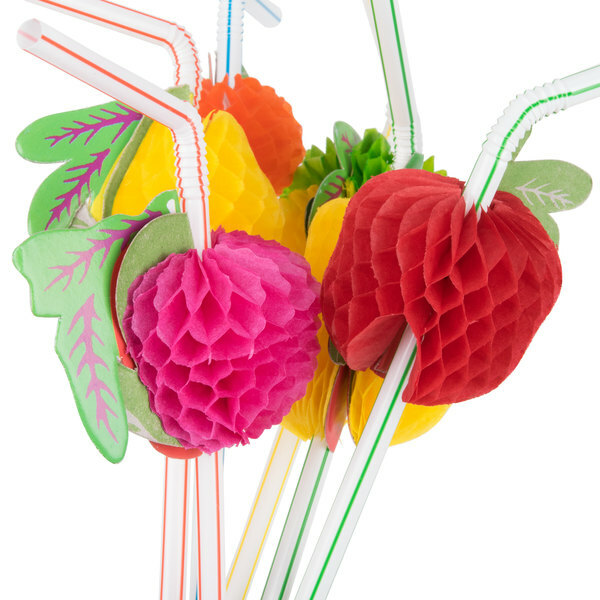 Each flexible drinking straw comes with a vibrant, honeycomb paper fruit decoration. 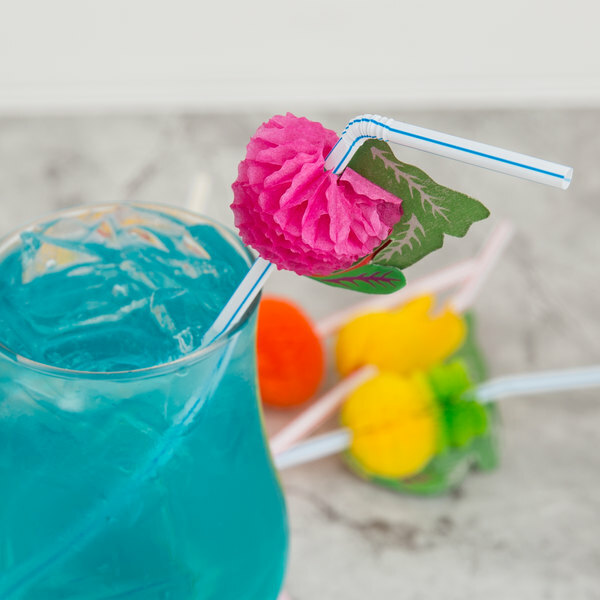 They're easy to assemble, and are perfect complements to cocktails at pool parties, resorts, beaches, or tropical-themed events! 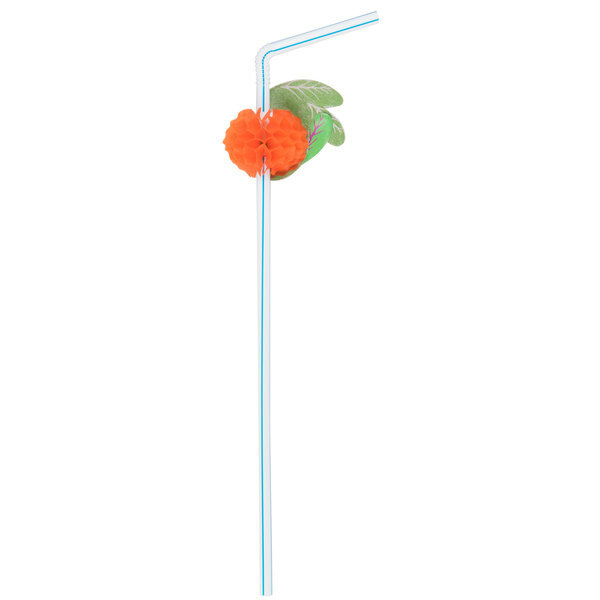 These jumbo straws are best used with pure liquid beverages such as juice, water, or soda. Approximate Fruit Size: 1 3/4"
Great paper fruit straws, mostly use on fancy catering gigs, but they are so cheap we use them in several cocktails, and the chef even uses them on apps. These cocktail straws are so awesome. They are even great for kids drinks as well. It is a quick easy and cheap way to add some flair to any drink. I love the royal paper assorted paper fruit straws for their look and quality. A great buy and excellent for serving at our luau parties. I love these paper fruit straws. They are even cutter in person. These were a huge hit at my party with the kids & grown ups! 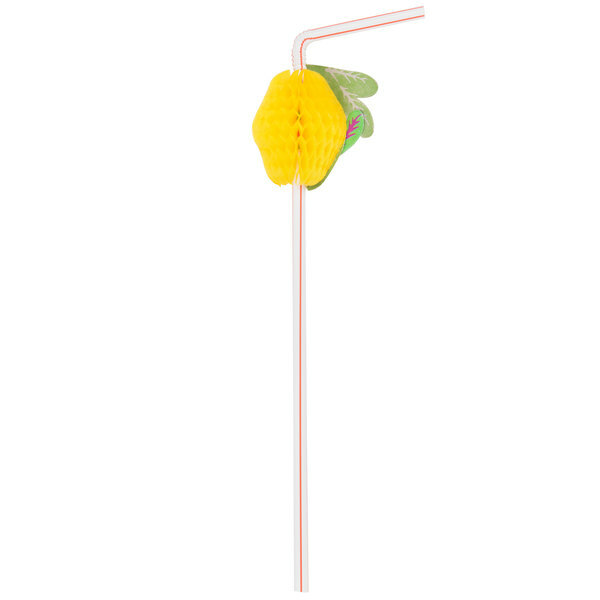 A great fun, fruit themed straw that are perfect for luaus and other themed events. 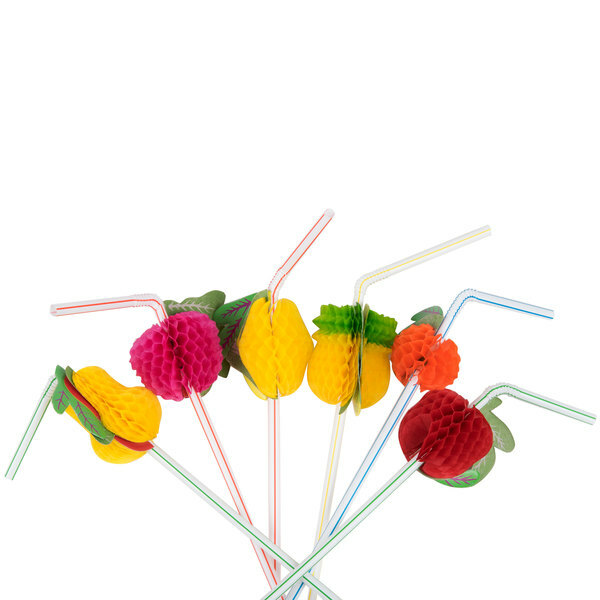 The straws are very sturdy and the fruit is very pretty. Perfect to add fun and flair to any summer party. My only complaint if any, would be that the box the straws come in could be a little more sturdier but this in no way compromises the straws. Love these straws a very nice way to compliment our drinks to the costumers. The colors are vibrant and the fruits adds a little bit of fun to our drinks. I would re-order these in the near future. 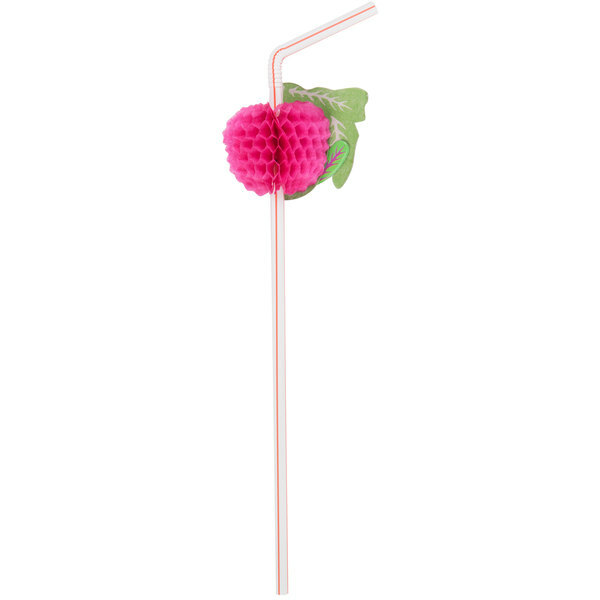 Cute, fun straws that were perfect for the drinks at our event. Some of the pineapple straws, however, had trouble keeping open and staying together. 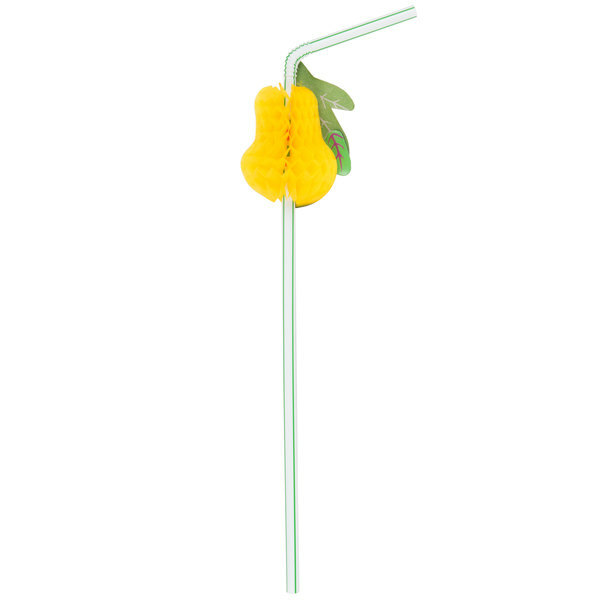 These straws are great to offer with kids meals!! Kids enjoy them and parents like the quiet they provide during the meal!! Very cute straws!!! We recently had a company get together and I order these straws. My employees loved them and many even grabbed an extra one or two to take home to their kids. Definitely worth it!! 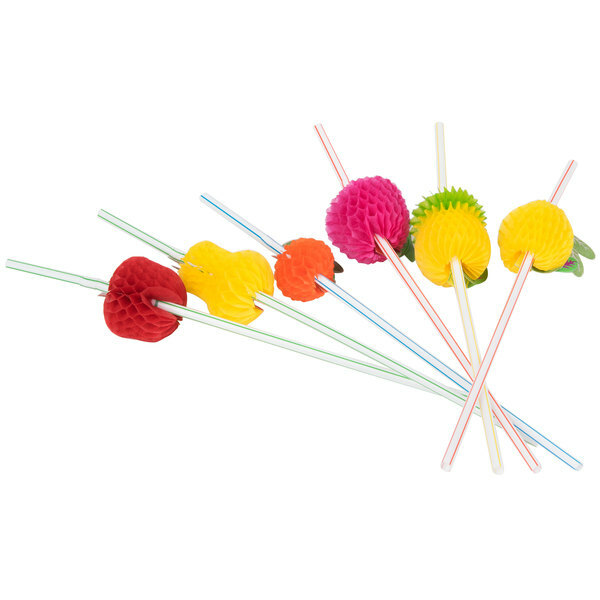 These straws are great for any kind of party or get together. Add to to any drink and it makes it more festive. Great for margarita night. These are great for all of our get togethers!! I had never seen anything like them and for the price i decided to try and they were worth it so many complements and smiles!! 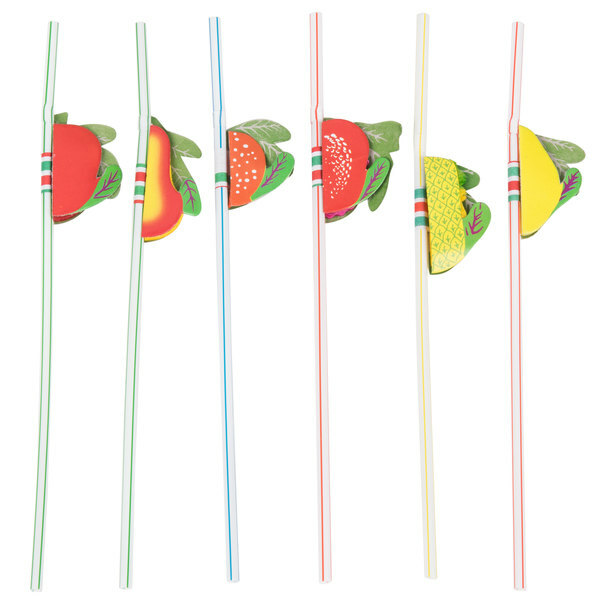 These straws are so cute and unique, everyone always comments on them at our family BBQs. I'm always getting questioned where I got them from and once people saw the price they all ran out and some for their BBQs and parties too.